Flickr is an image hosting and video hosting website, and web services suite. More and more users use the Flickr to share videos and photos as a personal blog in the format of social media. If there are some interesting and cool video clips of your purchased movies from iTunes Store, you want to extract it and share with others, how can we remove the DRM protection and extract video clips from the moves? Don't worry, M4V Converter Plus makes it easy and fast to solve. What you need are the purchased movies and the program - M4V Converter Plus. All the boring things can be removed and get what you need. To add iTunes videos to Flickr, you just need to remove the DRM protection from iTunes videos and nothing to worry about video views. And removing DRM protection from iTunes video is so easy with M4V Converter Plus. It can display all iTunes videos according to the iTunes library including movies, TV Shows and music videos. M4V Converter Plus can get rid of DRM from iTunes videos purchased or rented from iTunes Store. And you can set the Flickr video format before converting to suitable on Flickr. First of all, go to download the latest version of the M4V Converter, after the installation, run the software. Step 1. 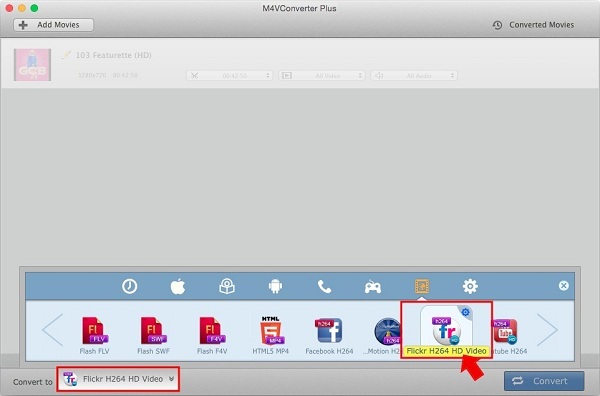 Add iTunes video to M4V Converter Plus. Click Add Movies button and choose a video listed in the pop-up window. Then click Add. Step 2. Choose the Flickr video format. Click Convert to drop-down list and choose Flickr H264 HD Video as the output format. Step 3. Start conversion on Mac. Click "Convert" button to open the converting box and start converting. After conversion is done, you can get the iTunes videos with the Flickr format. Then you can upload the iTunes video and share on Flickr.